This reminds me of that one song Dominic the Christmas Donkey. @DividedAlliance, HUZZAH! A MAN OF QUALITY! She eats you when you’re sleeping, She eats you when awake. 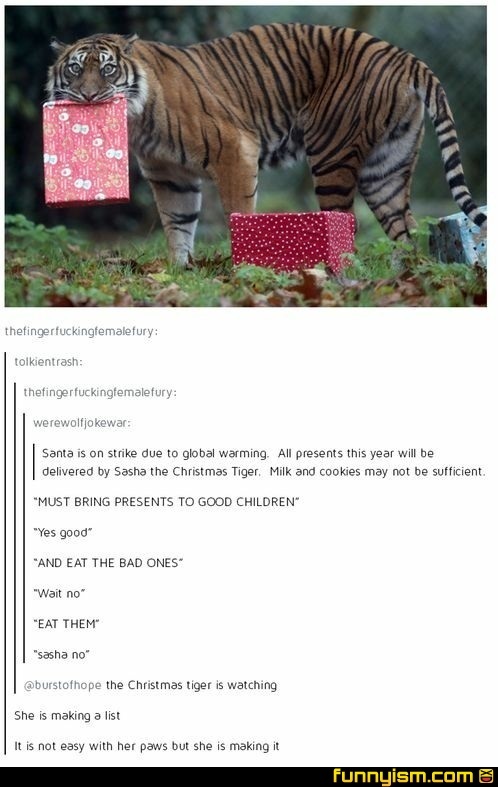 She knows that children taste real good. Sasha thinks you taste like steak. Sasha’s Claws are comin to toooowwwnnnn. Sweet. Now make some wholesome old school clay-mation movies replacing Santa with Sasha. My favorite is The Year Without Sasha's Claws. Sasha just absolutely mauls the heatmiser and snowmiser. @aminalFacks, Yes! That would be the best things ever.